When converting paper forms and manual process to electronic forms and automated workflows our customers are looking for solutions that lets them control the design. Often a cookie cutter solution doesn’t fit the way your business works. 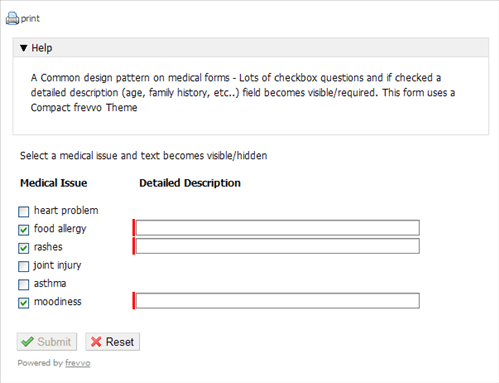 Yesterday a customer needed a form that allowed for a comment for every selected medical issue checkbox option. In fact, the business required a detailed comment for each selected issue. Most eforms allow for a single comment per set of checkbox options. Using Live Forms’ business rules and theme customization features they created the web form they needed to fit their specific business requirements. We agree with our customers… it’s very important to have a solution that enables YOU to control the form design and workflow so that it fits YOUR business rather than shoehorning your business into a solutions that doesn’t quite ever fit. Next Post got pdf? Attend this upcoming webinar.